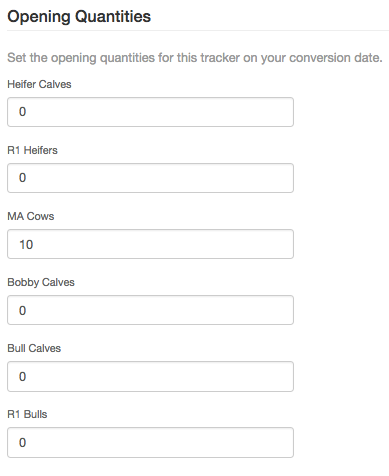 Within your livestock trackers, you will have an option to set your Opening quantities on your conversion date, as well as your Budgeted opening quantities for the year that you're in. For further information on your livestock tracker setup, click here. Your opening quantities on your conversion date are set within your Tracker settings, underneath your account mapping. CONVERSION DATE: The date that you begin using Figured and recording your actuals. You have the option to go back into previous financial years and input data. If you went back to 2016 and inputted livestock movements, then 2016 would be your conversion date. In order to have your current financial years opening numbers reflect what they actually are, you either need to make your conversion date the current financial year and set your opening quantities as normal. Or, you will need to set your opening quantities to reflect your selected conversion date, and using the stock balancer tool, make livestock movements so that your closing numbers of your conversion date will reflect the opening numbers of the current year. OPENING/CLOSING NUMBERS: A key concept to remember in Figured is that your closing balances for one financial year, then become the opening balances for the next financial year. When your global date settings are set to show budget you'll be able to view and update your budgeted opening quantities. On this screen you'll be able to manually key in the opening quantities or update from your actuals + forecasts. 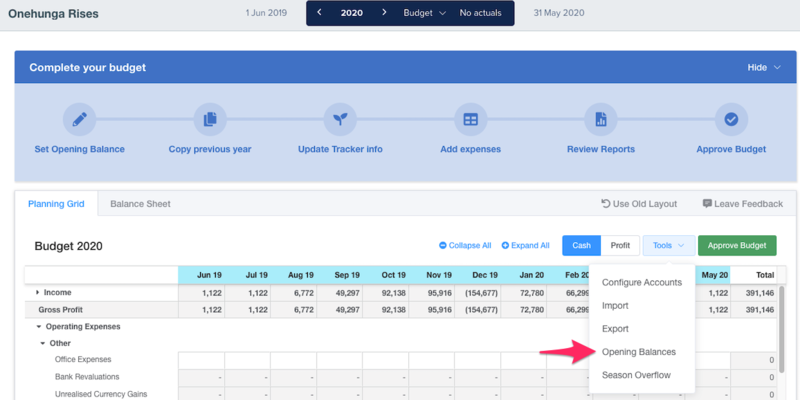 Your planning tab is where all of your farms other budgeting goes on, for more information on that click here. From within your planning tab, you are able to set your opening balances for your budget. Head to Tools > Opening balances and in there you can set your opening cash on hand and tax. NOTE: Figured does not hold any information regarding actuals, these come direct from Xero - if your opening balance in your Actuals + Forecasts does not look as you're wanting, you need to check in Xero. In order to give your opening livestock a financial value, you'll need to first complete your livestock valuations for the previous financial year. You'll want to ensure that your closing balance for the previous financial year reflects the current financial years opening numbers. For information on how to complete your end of year valuations, click here.